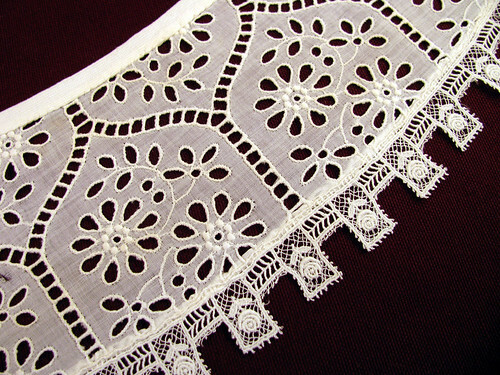 Most of the lace I have been showing on this blog came from my paternal grandmother. Other pieces have come from antique malls across the country. Rick is a memorabilia collector, so we like to stop and explore from time to time. I am picky and won’t pay much. The piece has to be special, like having an interesting technique or detail. 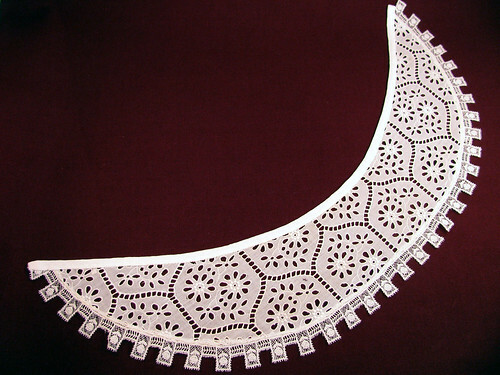 This collar has an very pretty tabbed lace trim. It is too fragile to ever be worn again. In fact in preparing it for this photograph one of the tabs was pulled and even being especially careful, I tore it trying to straighten it. I fixed it, but it is best to leave well enough alone. You may also notice places in the eyelet that are starting to disintegrate. The eyelet fabric is very thin. The shape of the collar pattern as laid out in this first photograph shows the a slight curve. A shallow curve means more roll at the back of the neck. Here is the collar laid flat. The tab at the bottom is only folded under it is not the place I fixed. That is on the other side. I need to turn off the info. view on the camera before taking a photo. That way I will be able to see imperfections before downloading to the computer. Here is the collar curved more into how it would look when worn. See the stand at the back of the neck? The ninth tab from center front along the bottom is the one I fixed. Here is a close up of the eyelet and lace tabs. On the left side you can see one of the holes developing in the thin cotton eyelet. 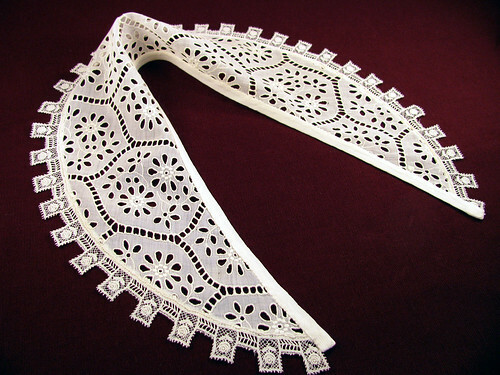 This entry was posted on Tuesday, March 17th, 2009 at 3:00 am and is filed under Lace, Sewing and Vintage. Tagged: Clothing, Fabric, Lace, Needlework, Sewing, Vintage. You can feed this entry. You can leave a response, or trackback from your own site.